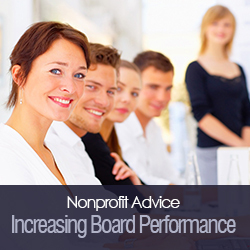 Your board is an incredibly valuable resource to your organization. Both when assembled and in smaller groups, board members have a role in stewarding the trajectory of your organization––and provide oversight through participation on audit, finance, real estate, fundraising, marketing, and search committees. And managed well, they encourage and empower staff to excel without intruding too far into day-to-day operations. These roles, along with some financial support, are usually what board members sign up for. But often board members are tasked with another, less comfortable role: they’re asked to go out into the world and be ambassadors! And even though most board members are giving their time and dollars because they truly believe in your organization, when asked to be apostles––to increase interest, open doors, and generate support––eyes tend to look down onto the boardroom table or up to the clock. they just haven’t “done it before”…so they’re naturally uncomfortable. That said, you need these people to be your adjunct marketing-recruitment-development force. You need them to build and reinforce your brand––and to increase your gravitational pull. So some training is in order. You may be blessed with a board member or two whose skills are in branding, marketing, and communications; if not, a consultant with this expertise, and more than a little experience in working with nonprofits and their boards, will need to be retained. First, who are your constituents? What do they care about, where are they geographically––and what do you want them to think, feel and do? Messaging, and indeed, conversation, is always with someone. So it’s important to know something about your audiences if you’re to move them in your direction. What category of organization are you? What’s your model? Sounds like a simple enough question, but try it. It you fit into an established category, you can focus your efforts on showing that you’re the best in that category. If you don’t fit––or have to invent a new category––then you first have to establish this new category (before you can be the best). What are the areas of focus of your organization? You may be engaged in multiple endeavors and multiple lines of business. But what are the 3-5 areas of focus–– buckets––that these can be grouped into? No one can remember what’s going on in 17 labs, or across five outreach programs, or 12 programs to help the hungry. So find the threads that connect the bits and organize them into a memorable taxonomy. Similarly, what are the roles your organization fulfills? Are you performers, conveners, advocates, catalysts? Connecting areas of foci and roles will go a long way toward building your high-level story. Going a notch more specific, are there some signature programs that would help people to get a better handle on your operation? Not all of them, of course…programs that can be easily understood to serve acknowledged needs. Why are you doing what it is that you do? What’s the shared vision that you’re trying to realize? What will be different if you’re successful––or more successful? You take on the roles that you do––and focus on the areas that you do––to accomplish something(s). Think of this both rationally and emotionally––as you and your board members will have to be able to talk on both levels if together you’re to interest and enlist others in your enterprise. Lastly, if these haven’t been evolved through some branding initiative, what are the brand attributes you want associated with your organization? These, usually adjectives, provide both a yardstick against which to measure your work––and provide color and tone to messages and conversations. If you’re “welcoming and accessible” then your elevator speech and its delivery need to be that. If you’re “hip and edgy” that gives another direction. If you’re “risk-taking and visionary,” then there are different cues, again. Getting your board familiar with all of the above will go a long way towards building fluency. If a board member thinks she’s about to have a conversation with a potential donor about x aspect of your organization, but the donor is not remotely interested in x and is passionate about y, having worked through the above, that board member will be able to pivot––and meet people where they are. Using the template, below, in a workshop setting, engage your board in a facilitated game of messaging Mad Libs. Try filling in the blanks with the output from the above: it’s fine if there are several suggestions for each blank. Then string together the pieces, making choices along the way––and use your brand attributes as adjectives. The first go-rounds won’t be compelling writing, but you’ll probably have the content to then craft a good, high-level message. ––––––––––––– (your organization) is a ––––––––––––– (big-picture noun phrase, category). And are worthy of support ––––––––––––––––(because…). Whales, and beyond––advancing orchestral music and engaging audiences from all walks of life. Through dynamic orchestra performances that span classical, jazz, film, and contemporary genres––and feature internationally celebrated conductors, soloists, and musicians––the SSO creates and provides opportunities to enjoy live art unfolding, escape everyday life, and be inspired. Innovative education programs build new audiences, bring the joy of music to the classroom, and encourage talented musicians in the pursuit of their dreams. Warm and welcoming, the Sydney Symphony Orchestra is yours: your great night out, your guide to extraordinary musical encounters, your cultural ambassador around the world, yours to take pride in and support. Of course, board members can’t read an elevator speech when they’re out ambassading. But because they were part of generating the message, there’s a much better chance that they will internalize it––much more so than if it were just slid across a table. The goal: have them make it their own, so it feels natural. Who is the protagonist in the story (individual or larger group)? Some back story about the protagonist: why should we care? Existing conditions: what is the challenge or opportunity? What role(s) did your organization play? Who in the organization was front and center in this story? What programs or services were brought to bear? How did the condition of the protagonist then change for the better? Is there a concrete example of the difference your organization was able to achieve? You and your board may be very clear on the value of your organization, but not everyone will agree. There will inevitably be resistance. People won’t find what you do to be as valuable and useful as you say; won’t want to participate; won’t want to contribute; won’t want to recommend. You’ll never get all on your side, of course. But your board-ambassadors have many opportunities to overcome resistance and bring people around. Resisters could simply be misinformed, carry around out-dated notions, or be overly influenced by a third party. Again, in a workshop setting, compile the most prevalent reasons that people resist: “Why would I go to the ballet? I’m not gay.” “If we support public radio our clients will think we’re left-wing liberals.” “Money to feed the hungry just gets eaten by the bureaucrats.” “The capital campaign won’t change anything; it’s just putting oil on the rust.” You get the idea. In small groups, create (and subsequently share) arguments you would muster to head off these unfortunate stances. Use the areas of focus, roles, programs, and stories you’ve worked through in earlier sessions. Board members will gain fluency––and staff will also benefit. You can also have fun setting up role-playing exercises: on one side of the table is the recalcitrant resister; on the other, the board member determined to convince; a third board member documents…and all share with the group at the end of the exercise. Wine helps. Gaining fluency is a process, not an event. Through the above exercises, board members will become a lot more comfortable representing your organization; they’ll significantly augment the paid horsepower of staff; increase your reach and awareness; and, in my experience, will also become more committed board members. But one flight of exercises isn’t the end. Schedule a refresher session each year––either in the normal course of meetings or at a retreat––and come up with new exercises where board members have to both evolve and use what they know to advance the organization. It might just be the board meeting that members most look forward to. To learn more about the author Roger Sametz, president and CEO of Sametz Blackstone Associates please visit sametz.com. Roger Sametz, president and CEO of Sametz Blackstone Associates (sametz.com), located in Boston is an expert on branding. Roger has worked with a range of clients from nonprofit and the cultural world to financial services, higher education and healthcare. No matter the industry, he has helped clients to better connect with their constituencies, start and nurture relationships and advance organizational goals.